Could we ever live on Titan? I've heard that Saturn's moon Titan has many of the prerequisite building blocks for life. Yet its extreme cold allows methane to exist in liquid form instead of water and helps Titan retain its unique, dense atmosphere. My question is this: When our sun becomes a red giant will this warm up Titan and, if so, what will happen to it? Could it become warm enough for life to develop? How warm could it get before losing its methane lakes and its atmosphere? David - There are many parts to Renee’s question. Titan is already warm enough for life if you go inside of it to where we’re pretty sure there’s an internal ocean of liquid water because we know the surface is de-coupled from its core and they rotate at slightly different rates. So, inside Titan, you could have Earth-like life or the kind of life we get at hot vents around the Earth’s ocean floor even at the present day. To answer the question about what will happen when the Sun warms up towards a red giant, which won’t happen for about 5 billion years so no need to worry. Yes, Titan will probably warm up and probably not be swallowed by the Sun so it will still be there. 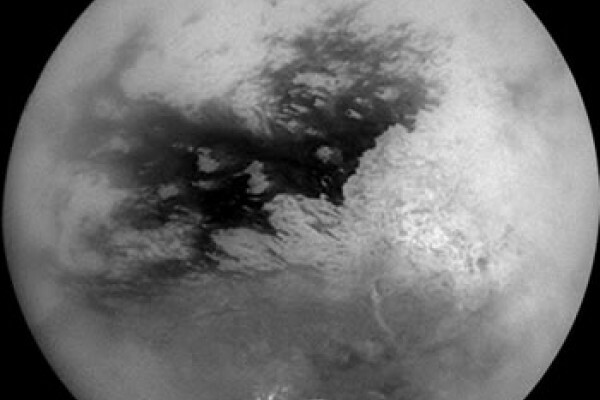 It doesn’t need much warming before Titan will lose its methane lakes. I think if the surface temperature rises by about 5 degrees, that methane will all be lost. It’s just on the cusp of being liquid on Titan. It’s the only body, apart from the Earth, that we know of which has a liquid phase at the surface which will rain out of the sky and form rivers, and pool together in seas and lakes - it’s a marvellous place. Well before the Sun has swelled up to a red giant and burnt the Earth away, Titan will have lost its liquid methane at the surface and most of the methane then will also be lost from the atmosphere, I expect, because it will be broken down by ultraviolet light into hydrogen which will escape, and carbon which will react with something or other. So, it will have lost its methane. Will it become a body that we can go and live on if the Earth’s uninhabitable? We’d have to live on the rocky remains of what’s inside which may be buried in too much water. It rather depends on how much of that water is then lost. If we’re still around in 5 billion years time, we’ll have ways to travel from one star to another I would hope. Otherwise, what have we been wasting our time doing? I don’t think we’ll be looking to cling on by evolving into something which can live on Titan. Previous How related am I to my siblings? Next How do electric eels get their energy?